Link Salad: Anecdote, Academia, and Alchemy…. Things are really busy over here at Elodin Enterprises. We’re gearing up for Worldbuilders, gathering donations, and trying to get the word out about the calendar. Speaking of which, N. K. Jemisin showed off her pin-up yesterday over on her blog. It’s one of my favorite illustrations from the calendar. In the blog she also talks about the creative back-and-forth that went into developing the picture. It was cool for me to see another author’s mental process in relation to one of her characters…. Here’s a fun blog someone wrote about reading my book called: 722 Pages Worth Reading Aloud (even if you’re covered in small children. Apparently there’s a class out there with NOTW as one of the core texts. And I have to say, they’re not entirely wrong. I would just like to say that Sim did it first. Lastly, if you’re curious, I’ll point out that there are a few new images from the calendar over on the Tinker’s Packs, if you’d like to wander over and check them out. The title of this blog makes more sense if you pretend you’re singing it…. Today we’ve got some Link Salad and an interview. 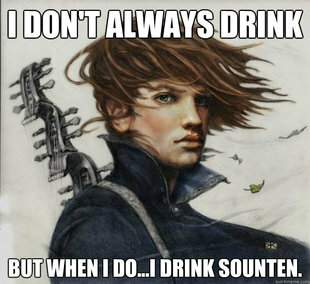 So apparently, (he said without preamble) folks have been making Kvothe memes. In a similar vein, someone sent me a link to a blog appropriately titled “My God What Horrors have I wrought?” A blog in which they take several pictures of me and… well… lolcat them. I really don’t have anything to say about either of these things. I find myself ambivalent, but strongly ambivalent. It’s like feeling extra-medium about something. It’s like yesterday. I was digging in the garden with Sarah, and I found a rock that was kinda cool, so I wanted to show it to her. “Look at this cool rock,” I said. She looked at it. “Cool,” she said. Then I just stood there holding it. Kinda at a loss. “What are you going to do with it?” She asked. And that’s where I kinda stalled out. 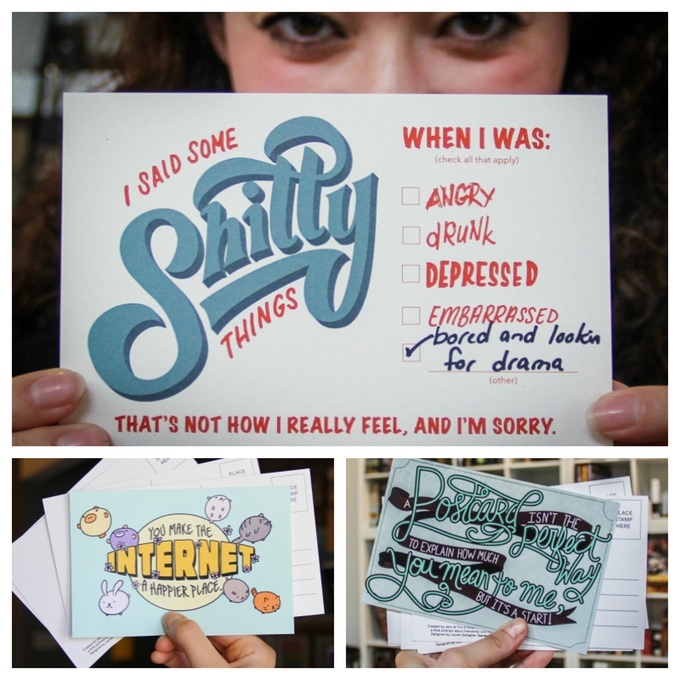 The main thing I wanted was for other people to acknowledge that it was interesting. It wasn’t purposeful. It wasn’t useful. It was just…. There should be a word for that. I think we have a hole in the language. We need a word for something that feels more significant that it actually is. Or perhaps something which is only significant in that it possesses a feeling of significance beyond any practical value or purpose. Is adjectiveize even a word? It should be. Adjectiveate? Either way, I’m pretty sure I’ve just invented at least one word up there. So I can cross that off my list for the day. I think ‘hygapean’ is the right way to go though. Pronunciation: Huh Gape Ian. Emphasis on the first syllable. There. Now each of you has to use it at least once today and we’re all set. In other news, here’s a photographer that makes me feel like I really should step up my game when it comes to taking pictures of my kid. And lastly, here’s an interview I did over at Toonari. I’m busy getting caught up on some a backlog of work so I can focus exclusively on writing after that, so today we have link salad. First, here’s an interview I did for the Denver Post a while back. This interview ended up being a bit different. It was a phone interview. (That’s not the different part.) And when the journalist called, she asked if her daughter could listen in, because she was a big fan of the books. I said it was no problem, and when I found out that she was 18 and about to leave for college, I asked if she wanted some advice. Because I have a weakness for giving advice, and if there’s one thing I know, it’s college. She said yes, so I gave her some advice. What’s interesting is that they included the advice to the daughter in the interview. After re-reading it, I’m happy to say it was pretty good advice. It wasn’t just a product of over-caffeination. Second, I wanted to point folks at Wednesday’s comic over at Real Life. Why am I pointing you at that comic? Because right now I’m brewing a batch of mead, and I have done exactly what he’s talking about. Except without the smartphone. Because I’m apparently the last person on earth without a smartphone. Thirdly and lastly, a quick story. Or rather, a series of stories that make a sort of story gestalt. Though I don’t gamble much, it’s always fascinated me. Back in high school, I used what little calculus I knew to create a roulette betting system that I was pretty sure would make me rich. Luckily, at that point in my life I didn’t have access to a car or a line of credit. What’s more, when I wrote a computer program to model my betting strategy, it kept losing money. So I gave it up as a bad idea and kept playing D&D instead. 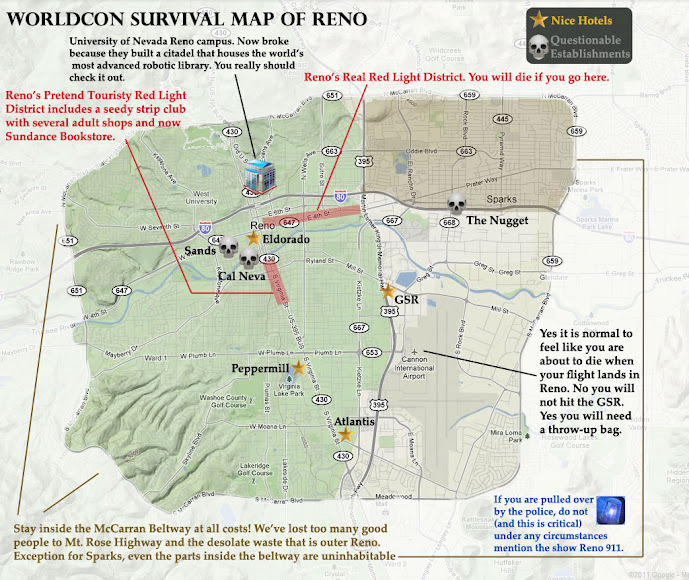 Fast forward to last year, when Worldcon was held in Reno. 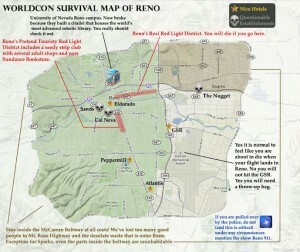 A reader contacted me and asked if I’d like some help finding a room in Reno. Jade worked in the hospitality business, and hooked me up with some accommodations. I got a kick out of it, and posted it up on Google+ for other people to see. I nodded. This didn’t surprise me. I had the same impulse when I saw it. The main reason I hadn’t already gone myself is that I was too busy with the convention. “Did you die?” I asked. At that point I decided to take Jade’s advice a little more seriously. And, as you can see, I’m still alive. So I count that as a success. I found out a couple months back that Jade had actually started up a blog where he talks about casinos and gambling. It’s not only funny, but informative, as he has a insider’s knowledge of casinos and casino towns. P.S. We’re still shipping out Worldbuilders prizes. So keep an eye on your mailboxes. So I’m kinda swamped right now with one thing and another. I’m struggling manfully with NaNoWriMo, trying to get ready for Worldbuilders, and working on putting new inventory in Worldbuilder’s online store: The Tinker’s Packs. And, on top of it all, I’m attending a convention this weekend in Wisconsin Dells. I wasn’t planning on going to the Dells this weekend, I was going to try and knuckle down and focus on my wordcount. But the local sci-fi convention that’s based here in Stevens Point got hit with a sudden change of venue when the convention center here in Stevens Point unexpected closed a month ago. But the folks at Daishocon didn’t let that stop them. They called around and found somewhere else they could host the convention: The Kalahari in Wisconsin Dells. Which is kinda cool, because now I can take Sarah and Oot to play in their indoor water park in between my panels. 1. If you’re at loose ends this weekend, and want to come to a gaming/sci-fi/anime convention, you should stop by Daishocon. Not tonly will we I be doing three panels on Saturday, but we’ll be holding an auction for worldbuilders. Best of all, fellow fantasy writer and Wisconsinite Scott Lynch will be there, too. So for the blog today, you’re going to get link salad. An interesting miscellany of stuff I’ve been meaning to share for a while now, but for some reason or other, I haven’t gotten around to it. First and foremost, Goodreads is holding their annual Choice Awards. The Wise Man’s Fear has been nominated for a couple of categories, so you can wander over there if you like. Or, if you’re not in a voting mood, you can subscribe to my profile over there, so you’ll get a heads-up when I post up a review of a book. Secondly, here’s a link to a video interview I did with Speculatesf a while back..
Nextly, someone posted a cool flow chart using all the books in NPR’s list of 100 best sci-fi books of all time. It’s a very tongue-in-cheek “how-do-I-find-the-book-that’s-best-for-me?” chart, and you can test your geek street cred by seeing how many of the jokes you understand. Penultimately, here’s a link to an interview I did with my UK editor when we were both at World Fantasy convention last month. And lastly, a blog where someone compares different writing styles to different deserts. It struck me as an interesting way to look at the situation, and I will admit that I was a little tickled to be referred to as tiramisu.